(Sub-Mariner I#10 (fb) - BTS) - Around 600 A.D., the Lemurian emperor Naga obtained the Serpent Crown, with which he enforced a tyrannical rule of his people. (Sub-Mariner I#10 (fb) / Daredevil Annual#4B/6) - Eventually, some centuries later, a group of Lemurian telepaths rebelled against Naga. Learning of the rebels, Naga captured one of their number, Aurwel. The rebel cursed Naga and refused to give in to his interrogation. Naga tried to tear the information from Aurwel's mind, but found that his telepathy shielded his thoughts. The enraged Naga blasted Aurwel's head off with his power. (Sub-Mariner I#10 (fb) / Daredevil Annual#4B/6) - The other rebels, including Bekkit, Jhandark, and Pyscatos debated whether to steal the Crown or attempt to slay Naga. Ultimately they decided that their numbers were too few to stand against Naga's army. Pyscatos personally slipped into Naga's chamber in the middle of the night, stealing the Crown and escaping with the Crown alongside his allies. Their presence shielded by their telepathy, the thieves fled southward to Antarctica, while the rebels used their own self-hypnosis to protect themselves from the Crown's demonic influence. (Daredevil Annual#4B/6) - The rebels arrived in Antarctica. Jhandark had concocted a potion that enabled them to breathe air while turning their scaly skins pink and smooth. Exploring a nearby cave, the rebels found a massive dynamo and other equipment, built by the Atlanteans who had settled in nearby Pangea before the Great Cataclysm. 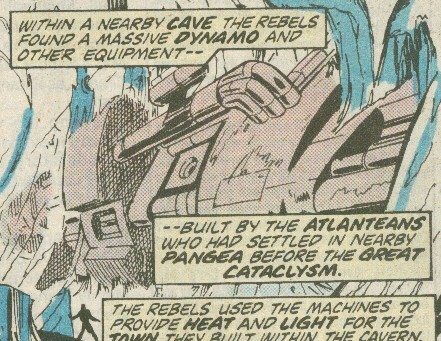 The rebels used the machines to provide heat and light for the town they built within the cavern. (Sub-Mariner I#10 (fb) / Daredevil Annual#4B/6) - Bekkit encased the Crown in an unidentified substance to protect them from Set's influence. (Daredevil Annual#4B/6) - Pyscatos and Bekkit jointly governed their community for years. (Daredevil Annual#4B/6) - Eventually Bekkit bid his brother farewell and left his new bride Jhandark and their children for a voyage to establish contact between the rebels and the human race. (Daredevil Annual#4B/6) <19th century> - For decades Bekkit traveled widely and came to know many of the statesmen of the age. Bekkit's community of long-lived telepaths became known in scholarly writings of the time as the Ancients. (Daredevil Annual#4B/6) - The aging Pyscatos nearly perished from a strange illness. Looking into the face of death and recoiling with fear, he saw the Crown as the only means with which he could escape his own mortality. (Daredevil Annual#4B/6) - Donning the encased Crown, Pyscatos fell under Set's spell and spread his influence over the rest of the colony, each of them taking on the half-reptilian appearance that Naga had demonstrated. The colony devoted itself to the worship of Set. (Sub-Mariner I#10 (fb) / Daredevil Annual#4B/6) - When Bekkit returned home, he was taken prisoner and brought before his mad brother, Pyscatos, who tried to convince him to join them in the worship of Set. Bekkit condemned his brother for destroying everything they had spent their lives struggling for, and he refused to bow before him. Pyscatos used the Crown's power to slay Bekkit; only after this did he see how far he had come since his days as a fiery rebel. Pyscatos sent Jhandark back out to sea in their submarine. That night he went alone to the great dynamo, where he marshaled his will, casting off the Crown and cursing Set. Realizing he could not resist Set for long, Pyscatos stabbed a knife into his own chest, and with his dying breath, he punched one last control, overloading the dynamo and causing it to explode, setting off a titanic avalanche that buried the settlement of the Ancients. (Namor I#52 (fb)) - In 1915, Ernest H. Shackelton brought The Endurance to Antarctica to obtain Anti-Metal (Antarctic Vibranium). They were confronted by the Sea Leopard, who allowed them to escape. Sea Leopard guarded the ship after it sank, not realizing the cargo had been lost. (Avengers Annual#18/3(fb)) - @ !920, the still-coated Crown was found amongst the wreckage of the Antarctic colony by Paul Destine, who had traveled there following the legend of the Ancients. Destine named it the Helmet of Power and used it to become the villain Destiny. 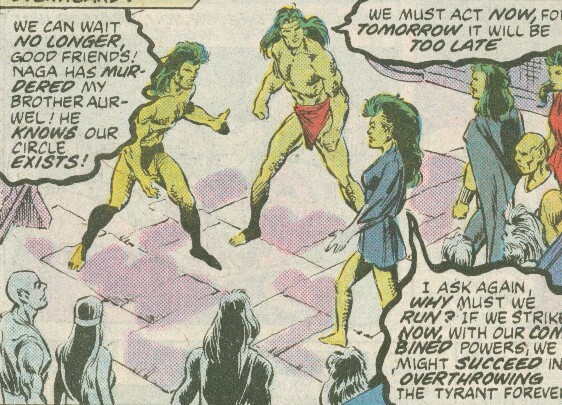 (Namor I#53 (fb)) - Sea Leopard made an alliance with Black Moray, offering to give him an ounce of Anti-Metal in exchange for each person Moray brought him; Sea Leopard intended to have these people worship him. (Namor#52,53) - Sea Leopard assaulted and defeated Attuma, who had taken over the Antarctic Atlantis settlement. 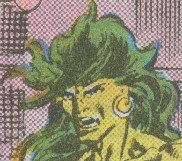 Moray led an expedition to Antarctica, leading to a confrontation with Namor and Andromeda, in which the Sea Leopard was ultimately defeated. COMMENTS: Created by Roy Thomas, Gene Colan, and Dan Adkins. The Ancients never referred to themselves by that name. It was used by others to describe them. However, Sea Leopard later described them as the Ancients. Also, it is possible that the Ancients referred to each other as brother and sister, and that Aurwel was not directly related to Bekkit and Pyscatos, or even that none of them were directly related. Or maybe they were. When the Atlantis Attacks annuals came out in 1989, they hadn't done a Daredevil Annual in so long that they forgot that there was already a #4, and they made another one. The original remains #4, with this one being #4B; numbering returns to normal as if this never happened, and the next annuals are #5, 6, 7. I believe that the Ancients were referenced by Destiny somewhere along the line in Tales to Astonish I#101, Iron Man / Sub-Mariner#1, Sub-Mariner I#1, 6, or 7. Sea Leopard demonstrates telepathy and voices some connection to the Ancients, but it is never detailed. Perhaps he is a descendent of Jhandark and Bekkit? Brother to Bekkit and Pyscatos, he was captured by Naga, but refused to expose his allies even under the pain of torture. Naga slew him. Brother to Aurwel and Pyscatos, it was he who coated the Serpent Crown in the material that gave it the form in which it would be known as the Helmet of Power. After speding years ruling jointly with Pyscatos, and marrying Jhandark and siring children, he spent decades traveling the world in the 19th century. He met scholars of the age and told them of the legend of his people. Upon returning to the City, he refused to join Pyscatos in kneeling before Set, and so Pyscatos slew him. She concocted the chemical which allowed them to take human form and breathe air. She married Bekkit and bore him children. After Pyscatos slew Bekkit, he came to his senses long enough to send Jhandark and her children away from the City via their submarine. She and her children are the only known survivors, but their subsequent fate is unrevealed. She is only glimpsed in the top right panel, as well as in the background, in shadows in others. Brother to Aurwel and Bekkit, he personally stole the Crown from Naga, and he ruled their colony side by side with Bekkit for years. After Bekkit's departure, he succumbed to the urge to don the Crown and became a servant of Set. 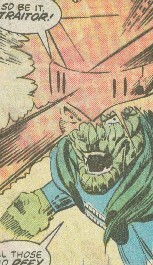 When Bekkit returned and refused to join him in Set worship, Pyscatos slew him, but this shocked him back to his senses. He sent Jhandark and her children away, after which he cast off the Crown, slew himself, and destroyed the City with his dying breath.